The Burger King in my neighborhood has been brewing Seattle’s Best coffee for several weeks with little fanfare. I like Seattle’s Best in general and it’s not easy to find outside of Border’s bookstores, where they are the standard Border’s Cafe company. 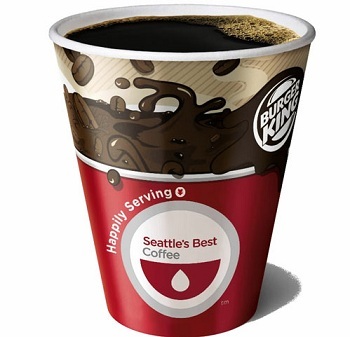 But in the month of November, Burger King is definitely making it known that they are now partnered with Seattle’s Best by offering Free Coffee Fridays all month long. On Fridays, during breakfast hours (before 10:30 or 11, depending on the store) you can get a free small coffee without any other purchase. Drive through, walk in – however you go, it’s a nice treat to get this morning pick-me-up for free!